Darren had spent time with Northampton Town and Cogenhoe United before joining Rushden Town prior to the merger. The young keeper established a remarkable record at Nene Park as his first two appearances were separated by some five years. Originally understudy to Kevin Fox at Hayden Road, he made his debut for the injured Kevin Shoemake against Evesham United in November 1992. Following Fox’s recovery from injury, he found himself surplus to requirements, and returned to Cogenhoe United. His second spell at Diamonds came in July 1995, on a non contract basis, without making an appearance. He had a third spell with Diamonds in September 1997, joining again from Cogenhoe United after injury to Steve Cherry, and making his second appearance for Diamonds. 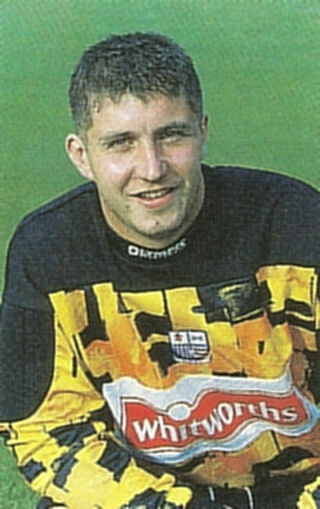 After a further six game, he was released March 1998 after the arrival of new signing Mark Smith. He went on to play for numerous other clubs including Raunds Town, Aylesbury United, Abingdon Town (2000/01), Wealdstone, Cogenhoe United, Newport Pagnell (2002/2003), Ford Sports Daventry (2003/2004), Stamford and Corby Town (2005/06). He had returned to Cogenhoe United by the start of the 2008/2009 season. Although retiring in 2011, Darren made a brief return, joining Long Buckby in October 2011 and playing in their FA Cup tie defeat at Kidsgrove Athletic as cover for their injured keeper. On 10 August 2012, Darren moved to UCL Division One side Sileby Rangers. He left at the end of the season after helping them to win the title and joined UCL Premier side Cogenhoe United in January 2014. His final move as a player was to Daventry Town in October 2016, and he continued into the 2017/18 season, but he had hung up his gloves by the end of the season.